The Adata Nobility Pro ships in a white box. Inside the box there is a lifetime warranty slip which also details download locations for the free software package that accompanies the drive ( we did not bother downloading it as most of the bundled software we have seen to date is pretty much useless compared to the freeware options that can easily be had elsewhere.). Adata have also indicated a maximum speed rating of 150 MB/s. Checking on the Adata website reveals that this drive has a claimed read/write speed of 150/25 MB/s. The Nobility N005 Pro measures 9cm long, 2cm wide and 1.1cm high. This is the third largest drive we have seen to date. With these dimensions this flash drive obstructs adjacent ports on a computer so you might need to get an extension cable if you have a lot of devices connected to the same cluster of USB ports on your PC. As well as being the third bulkiest drive the Adata Nobility is also one of the heaviest weighing 18 grams. The Nobility has an aluminium shell encasing it which gives it a good solid feel. The cap can conviniently be clipped onto the back of the drive while the drive is in use but it does not clip particularly tightly on either the front or back, leaving it at risk of loss. Unfortunately, unlike on most flash drives, there is no LED to indicate whether or not the drive is in use. The Nobility Pro scored 153/24 MB/s in the sequential read/write tests. 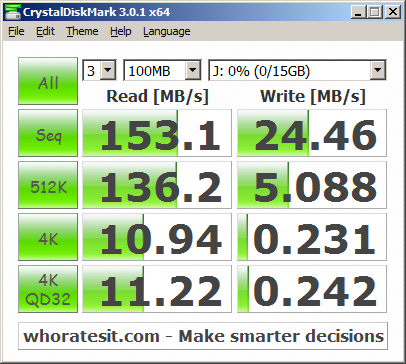 This sequential read speed is impressive, bested only by a small handful of drives. The sequential write is far less impressive leaving the Adata nobility trailing towards the bottom of the pack, for a relatively expensive pro drive we expect far better overall performance. The ATTO results for the Adata are broadly in line with the CrystalDiskMark scores and at 145/24 MB/s come in just under Adatas claimed read/write speeds of 150/25 MB/s. This test shows that the N005 would take 59.15 seconds to create a copy of a large 1GB video file. Given the Nobilitys relatively weak write speed of 24 MB/s this is a very impressive result. Most drives complete this test at half their write speed, the Nobility outperformed on this test. 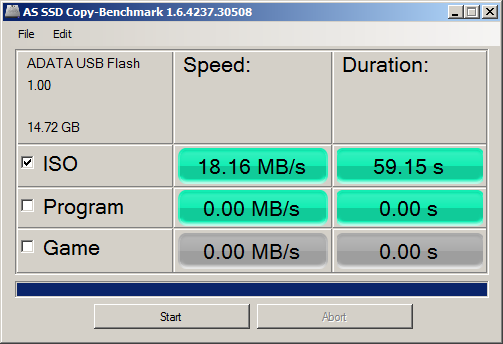 Despite a very strong sequential read speed of 153 MB/s, we are disappointed with this drive. Given its high price point we expect a more symmetrical read/write performance profile. The drive is not alone in this regard, all to often manufacturers focus on headline speeds rather than factors that will impact real world performance. The drive has no indicator light, is priced relatively highly and has below average write speeds. At this time there are far better deals to be had in the market. 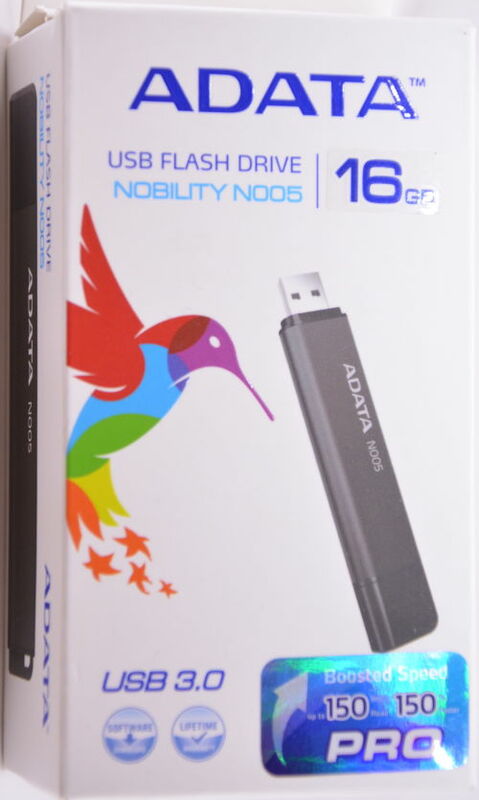 The Adata Nobility N005 Pro USB 3.0 16GB averaged 82.9% lower than the peak scores attained by the group leaders. This isn't a great result which indicates that there are much faster alternatives on the comparison list. 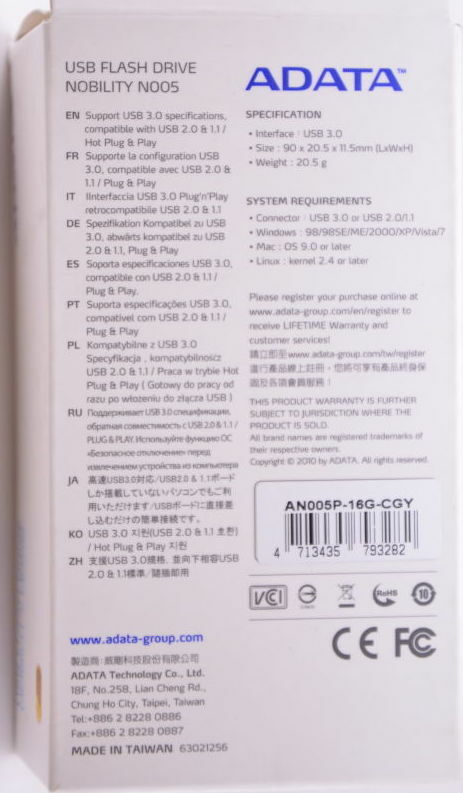 The range of scores (95th - 5th percentile) for the Adata Nobility N005 Pro USB 3.0 16GB is just 18.9%. This is a relatively narrow range which indicates that the Adata Nobility N005 Pro USB 3.0 16GB performs reasonably consistently under varying real world conditions. Read my full review and see the lab test results.